Once upon order placed we contact all our customers to confirm the details and delivery dates. Each piece of Chesterfield furniture is handmade in the UK to order by skilled craftsmen, who utilize traditional techniques to produce the highest quality furniture possible. Delivery charges for chairs is £50 per chair. Delivery charges for sofas is £40 per seat that means 2 seater sofa delivery price is £80, 3 seater sofa delivery price is £120 and 5 seater sofa delivery price is £200. For more info please give us a call on +44 1254 268590! The sale line is open from 09:30 and 17:30, Monday to Friday. 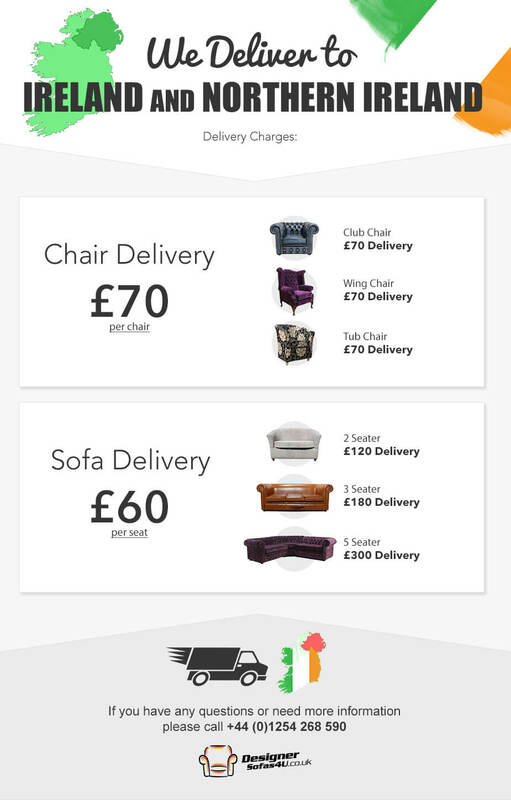 You can also send an email to info@designersofas4u.co.uk with your contact details and we'll call you back. To buy Chesterfield sofas & furniture in Ireland and Northern Ireland please click here.